For awhile now I’ve been thinking that it would be both interesting and challenging to have Woody’s music made more accessible to classical music groups – either large orchestras or smaller ensembles. Although there have been some arrangements and recordings of This Land Is Your Land over the years - the Boston Pops Orchestra for one - there hasn’t been an arrangement, or composition, that I feel presents Woody’s idea behind the song, albeit in the classical tongue! This got me to thinking. And after thinking, the creative juices just started flowing. My train of thought, as always, took some unexpected turns bringing up more than I anticipated; from personal memories, to musical compositions and performances I’ve heard over the years. Sparks of ideas began to fly. Working backwards on some inner trail, I was taken back to 1955. My mother, Marjorie Guthrie, was a member of the Martha Graham Dance Company from 1935 to the early 1950’s. She was in the original cast of the ballet Appalachian Spring when Aaron Copland was commissioned to compose the score for Graham. Brilliantly incorporating the Shaker hymn “Simple Gifts” into his score, Appalachian Spring has since become a classic – both the ballet and the musical composition. As children, we were taken annually to see all the Graham Company performances. I remember the first time we saw Appalachian Spring. Although we were very young, the experience was profound. I remember holding back my tears at the conclusion of the ballet as I watched the young, married couple settle on to their porch. With their life together just beginning, their postures held a steadied excitement as they prepared themselves for the work that lay ahead, and the challenges. I could feel all their innocent dreams and hopes and their inner strength. For me, Copland’s use of “Simple Gifts” conveyed the simple idea that having such a beginning was the gift itself. Appalachian Spring was played regularly in our home. My mother played the record on Sundays as she worked around the house. I felt her pride when we heard it on the classical radio station as we drove in the car. It was a very intimate experience for her, reminding her of her own beginnings as a young adult starting out as a dancer, meeting my father in New York during this period, and sitting on their own porch – a little tenement stoop in front of their apartment in Coney Island – as they began their own combined life and destiny. Somehow we children understood the tremendous meaning of this beautiful work and we would become still and silent, listening to the melody which resonated something of our own existence to us. I suppose I could say that to this day Appalachian Spring is our family song, representing our own beginnings, our family history, and the tone of our family life together as dreamed of by our parents. You could say it is our family anthem. Over the years, many people have considered This Land Is Your Land to be America’s alternative national anthem. Although most of us learned the song in schools, around campfires, at hootenannies and in folk circles, arrangements of the song have also been played by hundreds of marching bands around the country – from high school marching bands to the our military marching bands. This style of arrangement has become a staple at everything from Presidential inaugurations, national holidays to other public events and ceremonies. It is most often the chorus, rather than the verses, which are celebrated. My father certainly would have laughed at the irony. Go figure! Recently, I’ve been struck by the similarities between Appalachian Spring and This Land. Appalachian Spring is, in my opinion, a quintessentially American composition expressing much about the beginnings of our young, national soul with much ahead to learn and so much energy to work with. This Land holds a similar place in our national repertory, and I’ve often felt that it could be understood and heard as Woody’s continuation of the story. One could almost feel This Land as the child of Appalachian Spring. Woody calls this combination of attributes a Worker. But not only workers of jobs. Woody says we are also workers and growers of a country. Woody suggests that “you and me” are one continuous flow of workers of citizenry. He tells us that our most important job is to grow up and work up our best Ideas. This will naturally reflect in our individual, specific “job of work”. This Land Is Your Land is often trivialized, and it’s true meaning – as I understand it – simplified to a modest common denominator; an “America” defined by a temporary group of a few. This is always bound to happen. No matter who is in office, who is in charge, and which side they’re on, the translation of the song will inevitably be modified to serve someone’s agenda. And it often proves to be everyone’s agenda except Woody’s! With all this in mind, I approached acclaimed composer David Amram to ask if he would be interested in composing a new score based on This Land. In addition to having known Woody personally, David has been at the center of much of our cultural history, working and collaborating with the most diverse group of artists – from Dylan, to Kerouac, to Arthur Miller and on and on. Having composed a multitude of orchestral suites and film scores, including the original score for The Manchurian Candidate, it’s been firmly acknowledged that David is a musical genius in his own right. Rather than creating an arrangement, I asked him to create a composition that would express some of the song’s truer meanings - to use the text and melody as an inspiration, a foundation, from which he could expand on. Just as Aaron Copland honored “Simple Gifts” as his muse, so might David create an honest and honorable tribute to the many seed-thoughts which Woody planted within the lyrics of This Land. David and I have spent many hours talking about the lyrics, their meaning, and about Woody. We’ve talked about his life, his experiences, and talked about how they might have shaped him, and how they appear in all the six verses of the song. We’ve talked about society, culture, and politics. This summer, David traveled to Okemah, Oklahoma where he performed at the Woody Guthrie Free Folk Festival and where he talked with Woody’s family, friends, musicians and fans. We’ve had a lot of fun sharing our thoughts and feelings on all these topics. Of course, any conversation about This Land could (and will) go on and on. And I’m sure many of you reading this have additional points, comments and pieces of the puzzle to offer. That’s what makes This Land such an interesting piece to work with. I don’t think we’ll ever be able to nail it down, just as we can never nail down Woody. His vision might just be too broad and test our understanding. (With a wink, he might ask us to hear something in the marching band arrangements as an expression of something that could be equally used for some good). David Amram is now busy at work creating what he titles “Symphonic Variations on a Song by Woody Guthrie”. We are hoping that it will have a premier sometime in 2006, and have begun looking for the right conductor, the right orchestra, the right town and the right time. I truly look forward to the night when I will be able to sit in the orchestra hall and hear David’s work for the very first time. It will be as thrilling for me as the very first time I went to see Graham’s ballet Appalachian Spring. But this time, like the young couple, we will be the ones who will settle into our seats, our postures steadied with excitement as the conductor lifts his baton! On that night, I hope the conductor, the musicians, and the audience will experience the same pride my mother always felt when she heard Appalachian Spring – knowing that she was present when this new work was created and unveiled. I hope they will become still and silent, and listen to this melody – being one that is both so old and so new - and that it will resonate something of our own existence to us as citizens in this still young country. I hope it will touch us, mentor us, teach us, and guide us. I hope that future audiences will enjoy this new exploration of This Land and feel in it another new beginning. I hope it will sound of the work ahead of us and praise the many, many citizens that will do it. I hope it will pulse with the rhythms of our challenges and that we’ll feel like dancing through them! I hope we will feel our own much needed strength in it. I hope it will touch our national soul. 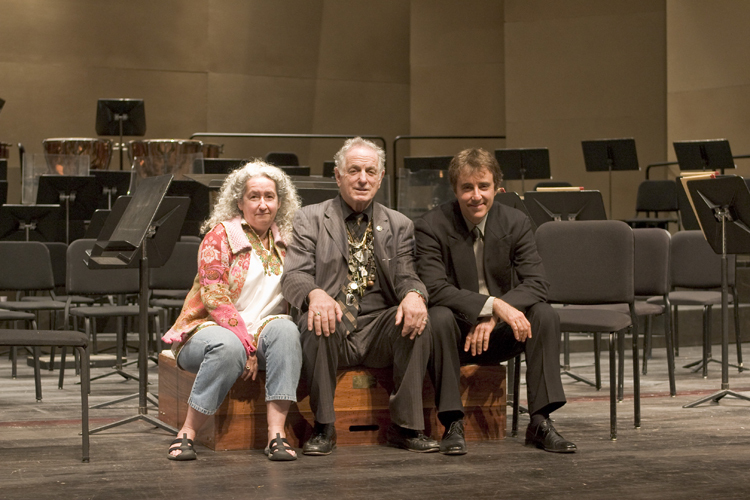 And to David Amram, sitting on his own front porch – the composer’s seat – I hope it will be a moment where he feels us all around him, as audience and as community, as we send him off with a smile and a hug. We wish him well as he takes on his own job of work - introducing “Symphonic Variations on a Song by Woody Guthrie” to the world.